It’s easy to make a website, but it can be hard to make an effective one that achieves your goals, is easy to use, and is enjoyable to browse. To do this, you should use strong User Experience (UX) and User Interface (UI) design principles to make the most out of your site’s potential. 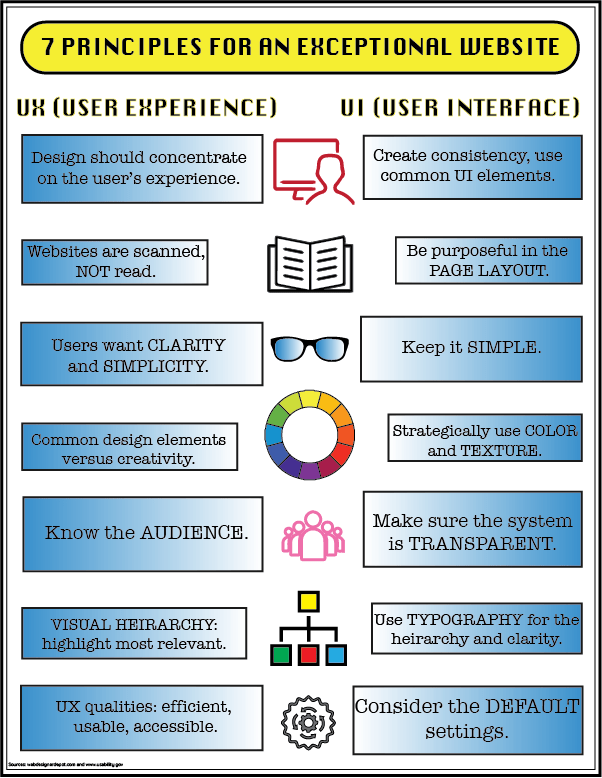 User Experience design focuses more on the conceptual aspects that make a good website such as research and interaction design, while User Interface design deals with the graphic elements such as color, layout and typography. Good use of UX and UI design principles is crucial in creating an effective website that will achieve your goals. We’ve broken it down into 7 key principles that will keep your readers raving about your site’s usability and design. The design of your site should prioritize your audience’s needs over everything else. Using consistent tools throughout your site such as familiar icons, buttons and tags makes your site less daunting to a new user. 2. Be purposeful in page layout. Let’s be honest: Most people won’t spend that much time on your website. Make it easy for visitors to find what they’re looking for. By being intentional with your page layout, you can make sure the most important information is the most accessible. People don’t want to work too hard to understand the point of your website. Keep information clear and simple so that it’s easy for your audience to understand the message you want your site to convey. 4. Strategically use color and texture. Nothing is more off-putting than a garish color scheme. If you want a user to enjoy your site, you have to make it easy on the eyes. There are tons of online tools to help you find the right color scheme for your site. Try Adobe Color and Paletton. Texture, or giving something perceived surface quality, is another design element you can use to keep your users engaged. Here are some examples of great texture usage in web design. 5. Make sure the system is transparent. Know your audience! Make sure your site is easy for your audience to navigate. Understand your demographic, then cater your site to them. Accessibility is an important aspect of usability. 6. Use typography for the hierarchy and clarity. Create a visual hierarchy by highlighting what is most important on the page. For example, using a large, eye-catching text for the most important information helps the users easily understand what information on your site is the most important. 7. Consider the default settings. The default settings of your site were created that way for a reason. Consider the reasoning behind these choices, and understand that many of these choices, such as simple navigational techniques and clean layouts, were made in the pursuit of efficiency and usability. Take notes from their simplicity. So why is this important to me? In the midst of all the complicated technical jargon that comes along with making a website, it’s important that you never forget to prioritize your user. Making information on your site both accessible and visually pleasing is the key to creating an exceptional website. If you’re looking for more inspiration, check out these sites that have some really cool design ideas. But most importantly, have fun with it. How can the 1893 Brand Studio help you improve the design and usability of your site? As a media agency centered on digital storytelling, we can do all of this for your company so that you don’t have to. We have extensive professional experience in all things public relations.